I'll weave and knit with green yarns, I'll wear green clothes, I'll eat green beans or peas or broccoli. But please don't put green food coloring in my mashed potatoes. Or (thank you, Dr. Seuss) in my eggs. And definitely, don't put it in my beer... We have a fun pub here in Threadville, and I often join the young folks there. Last year, I went with them on St. Patrick's Day. We had a great time, and I was able to choke down both mugs of beer as long as I closed my eyes, but what a weird color for beer. And don't worry, most of us live close enough to the pub to walk home afterward--though we all went to the beach first, just for a few minutes, to look at the ice. Last year was cold. Those who don't live close to the center of Threadville can stay with some of us who do, or take a cab or bus home. This year, the ice is already gone from Lake Erie around Threadville, and it should be warm enough to actually enjoy a late night walk on the beach.The pub owner ahead has promised not to color my beer. Before we go out for the evening, though, I'm heading off to the bakery. I love frosted cookies, don't you? And they make these darling shamrock sugar cookies, frosted in kelly green frosting. Yum! I think I'll buy a dozen . . .
Be careful out there, okay? Drink green beer if you must, but don't drink and drive. 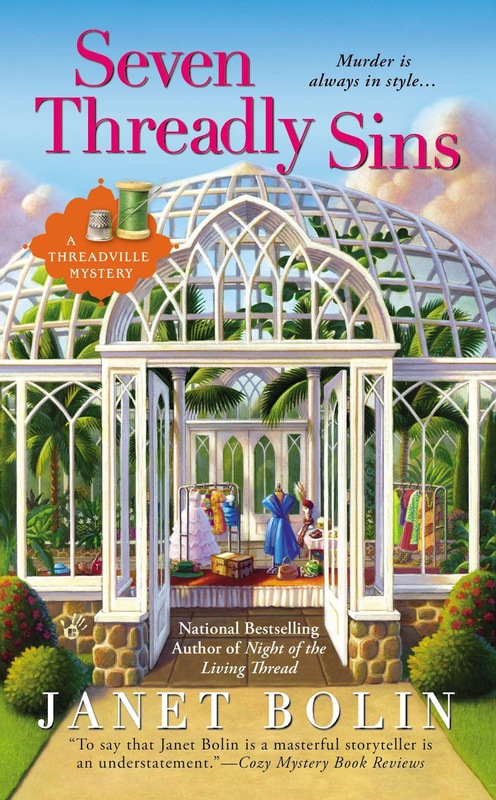 Read about how Dora helps solve a murder in SEVEN THREADLY SINS. 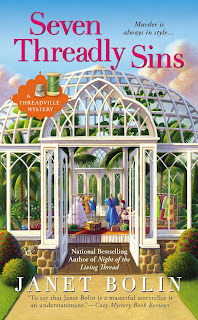 To read an excerpt from this and other Threadville Mysteries, click here. For a list of booksellers, click here. Follow Janet on facebook and twitter. Green doesn't go well with my complexion. But green frosting does!